To access the settings area for your account go in the bottom left corner where you could find your picture (if you have one). Click it and go the Account Settings. Here you can see or edit your name, email address, phone or company name. The personal data for your account can be accessed here, too. 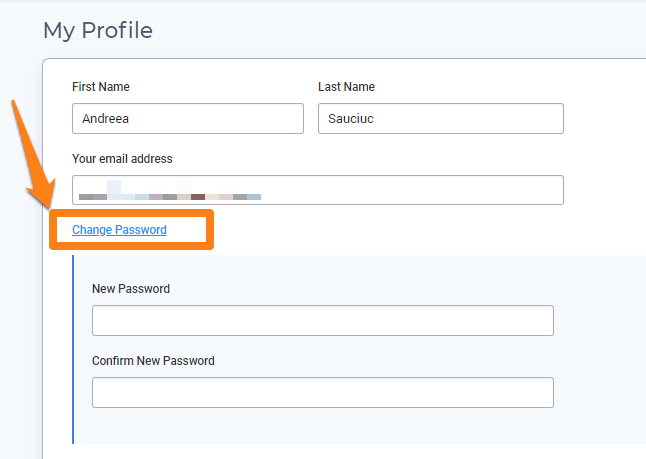 To change the password for your account click on the hyperlinked text and fill in the blankets with your new password. 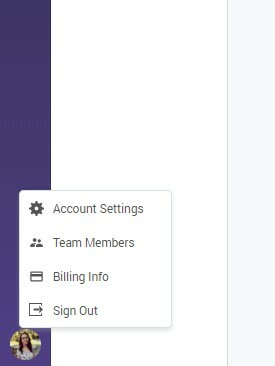 If you’re using an account for your business and want to add a colleague, go to Account Settings and then Add Team Members. The Administrator has access to all the account. The Standard User has limited access to the master Account Settings (at the billing information). The Custom role gives you the possibility to set the limitations as you wish. 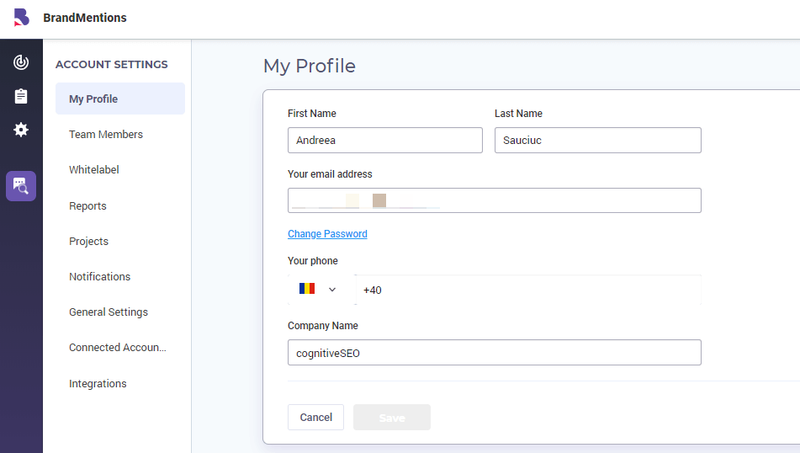 Set Invite and the user will receive the info and be added to the project. You can add different sub-users to different projects. You don’t add sub-users to the account level, but to the project level. The user that has limited access won’t be able to perform several actions. 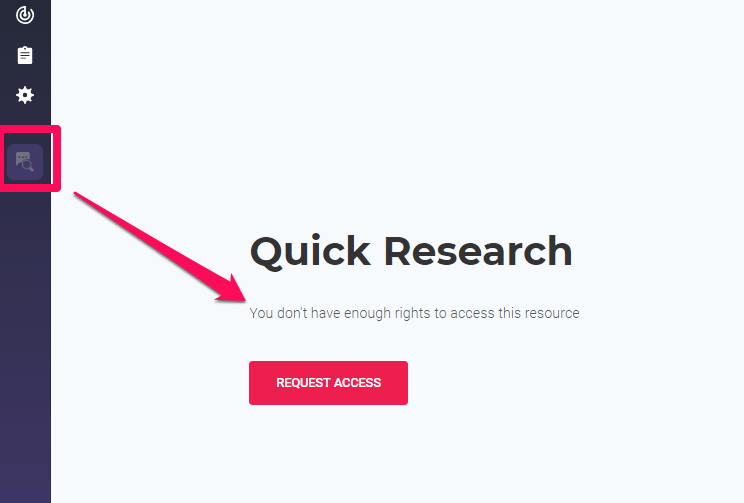 For example, a user can’t use Quick Research and it will be disabled from that specific project. As you can see from the previous screenshot, the Quick Research icon from the menu it is faded (disabled) and when you click on it, BrandMentions will serve you the next message: You don’t enough rights to access this resource. 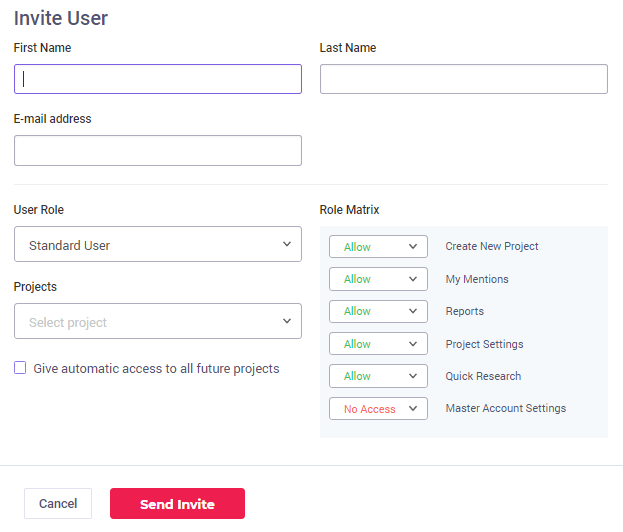 In case you are a sub-user to multiple projects, you’ll have to select the project. Every time you’ll log in you’ll have to choose the project you want to see. You select the project and click Continue to enter the project. 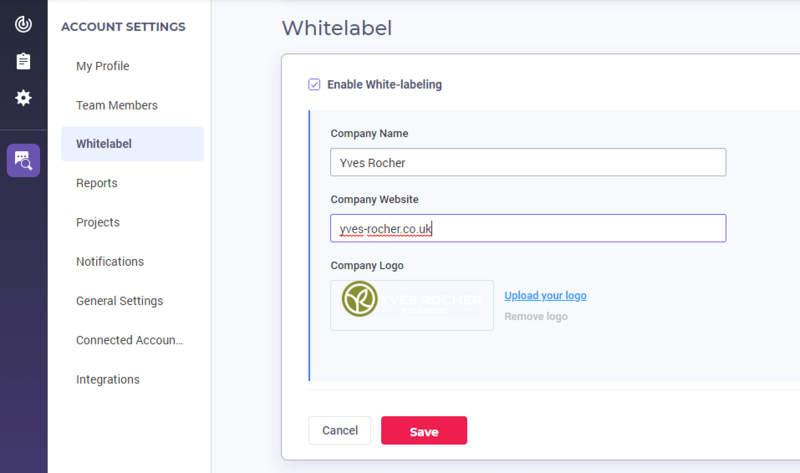 The Whitelabel is for customizing your reports with the name of the brand, the website, and the logo. You’ll have your own reports without seeing the BrandMentions logo. Enable the White-labeling, add your company name (that will appear on your reports), the company website and company logo. Go to Reports if you want to review or edit them, directly. Click on the edit button in case you want to perform some changes. It will redirect you to Reports Settings. 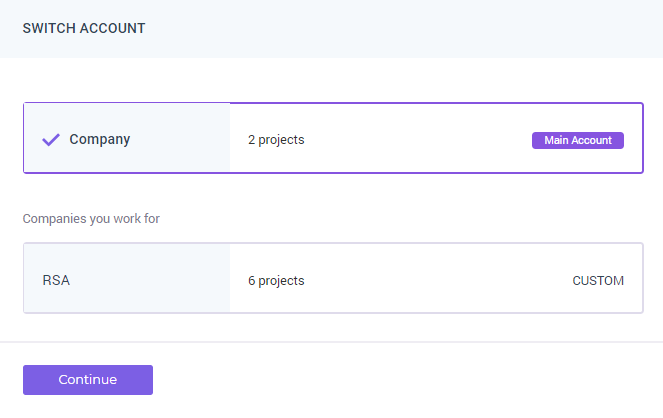 To see all the projects created in one account go to Accounts Settings and then Projects. Here you can edit the name of the project or delete it. By default, each user receives notifications regarding their project. To change the settings for the emails you receive go to Accounts Settings and then Notifications. Receive all the alerts in a single email. Each alert is connected with a project. If you decide to select this box you’ll receive an email with all alerts for all the projects you have in your account. Receive only browser notifications. If you select this box it means all the links you receive on your email will be opened using the BrandMentions preview mode. You can disable the preview mode from General Settings (next step). Receive all mentions in the email alerts. 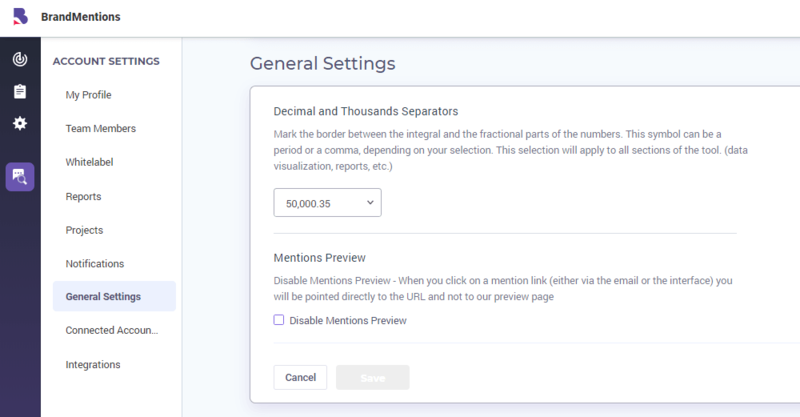 If you don’t want to login BrandMentions to look at your fresh mentions you can choose to receive them directly in your inbox, to easily review them. Mentions will be capped at a maximum of 300 mentions per email. Select your preferences and click Save. In General Settings area, you can setup the preferences for the separators used in your country. Since there is a big difference for “,”(comma) and “.” (dot) it’s best to mark the border between the integral and the fractional parts of the numbers so that everybody understands the exact number. This selection will apply to all sections of the tool (data visualization, reports, etc.). Another setting you can edit is the preview mode for your mentions. By default, the tool lets you see each mention in the preview mode. In case you want to change that, make sure you select the box that says Disable Mentions Preview. See all the Google Analytics accounts for your projects go to Accounts Settings > Connected Accounts. You have to authorize each account to gather more accurate mentions about your brand. Delete the ones that are no longer relevant for the project or add some more. For each new account you authorize, make sure you have the highest level of access to perform the desired actions. You can integrate your projects from BrandMentions with Zapier and/or your website through the Tracking Pixel. You’ll receive automate BrandMentions notifications via Zapier or Tracking pixel. Keep track of all your integrations and notifications from this area. You can also receive email notifications if you’ve allowed the tool to send you alerts. Add new mentions from BrandMentions to Buffer. Send direct messages to Slack users as soon as BrandMentions finds new mentions. Add new mentions from the BrandMentions app to a Google Sheets Spreadsheet. Save the new mentions found by BrandMentions as Evernote notes. Send Hipchat messages once BrandMentions finds a new mention. This way you can easily send automatic messages to your audience and to your team members. A more detailed article on this topic you can find on our blog.